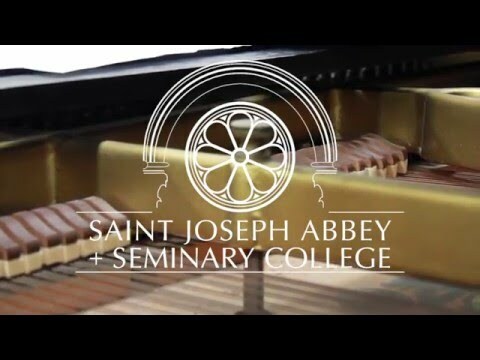 Jesuit alumnus John Guerra ’14, a seminarian at St. Joseph Seminary College and a gifted pianist, composed special music for a Mass that will be heard in its entirety for the first time at the upcoming Abbey Youth Festival (AYF). Guerra calls his arrangement “Mass of Mercy” and will debut it on Saturday, March 12 at the AYF, which attracts upwards of 5,000 young people to the seminary for a day of prayer and faith formation. John Guerra ’14 with Fr. Raymond Fitzgerald, S.J. ’76 at a donor reception in May 2015 for the renovated small chapel. Guerra’s “Mass of Mercy” music is copyrighted and recently received approval by a panel of U.S. Bishops. “The desire was to write a Mass that was beautiful, reverent, and could help us enter the mystery of the Mass as if we were at Calvary,” said Guerra, giving credit to his sister Olivia, who helped with the composing. Read all about Guerra’s “Mass of Mercy” in Finney’s Feb. 11 Clarion column: Seminarian offers his gift of music to the church. View the video of John Guerra explaining how his “Mass of Mercy” came to be. John Guerra '14 explains how his “Mass of Mercy” came to be.